The Missoula Hellgate Hash House Harriers is part of the international Hash House Harriers running clubs, better known as “A drinking club with a running problem.” We usually meet twice a month in beautiful Missoula, Montana for a true hounds versus hares run around town, through the woods, or up to the mountain top. Running experience is not required, but a love for beer is! Organized hashes occur every 4 weeks or so with a casual pickup hash in between. We love new boots (i.e., new hashers, a.k.a. virgins) and we love visiting hashers. Please join us for a run some time! An informal weekly gathering of local hashers and wannabees on Hump Day starting at 5:00 pm through happy hour and beyond. Location varies. Most of our daily interaction occurs in our Facebook group, which also include photos and write-ups from our past hashes. This is a private group for obvious reasons. 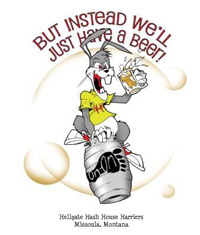 To join us in our Missoula Hellgate Hash House Harriers Facebook Group please contact us and we will send you an official invitation. We also keep a presence on Hash Space, so if you’re a member there look us up there and join our group.